Sporting a flag-filled tie, Chief Deputy Sheriff George P. March prepares to retire a collection of flags he had been saving. 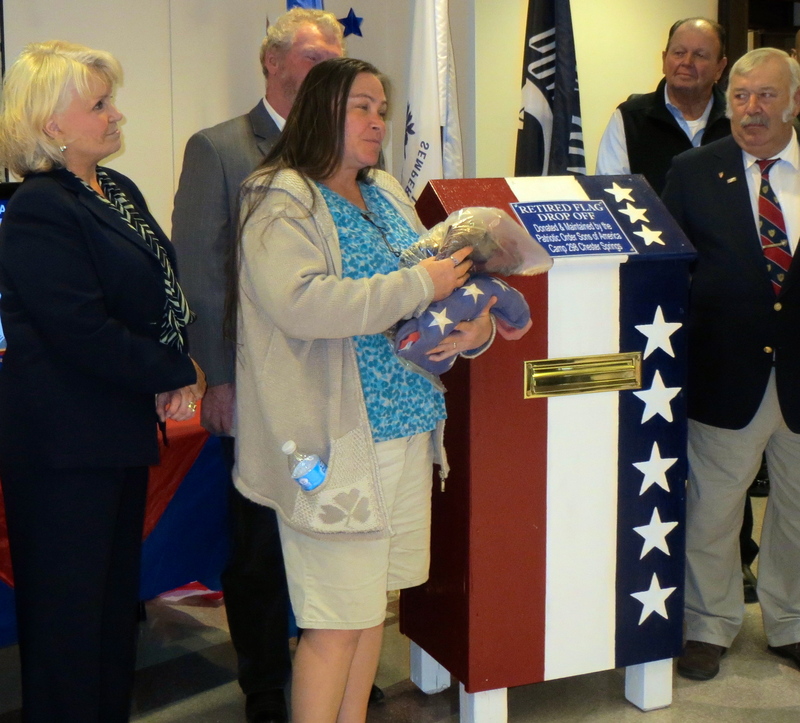 If you build it, they will come, and that is exactly what occurred Tuesday afternoon when the Patriotic Order Sons of America presented a large handmade flag retirement box to the Chester County Sheriff’s Office. Members of the patriotic fraternal organization’s Washington Camp No. 298, Chester County Commissioners’ Chairman Ryan Costello, members of the Sheriff’s Office and the public gathered at the Chester County Justice Center for a brief ceremony, which was followed by the deposit of more than a dozen well-worn flags into the box. 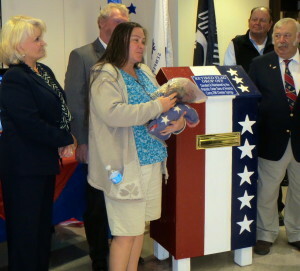 Chester County Sheriff Carolyn “Bunny” Welsh said the presentation resonated deeply for her because her late father, John R. Welsh, served as president of both the state and national lodge and worked with some of the members who attended the ceremony. “I’m definitely the daughter of a Yankee Doodle Dandy,” she said, recalling her father’s habit of walking around with a cassette player that blared John Philip Sousa music. As Chester County Sheriff Carolyn “Bunny” Welsh (left) looks on, Veronica Hoadley briefly explains the history of the flags she retired. 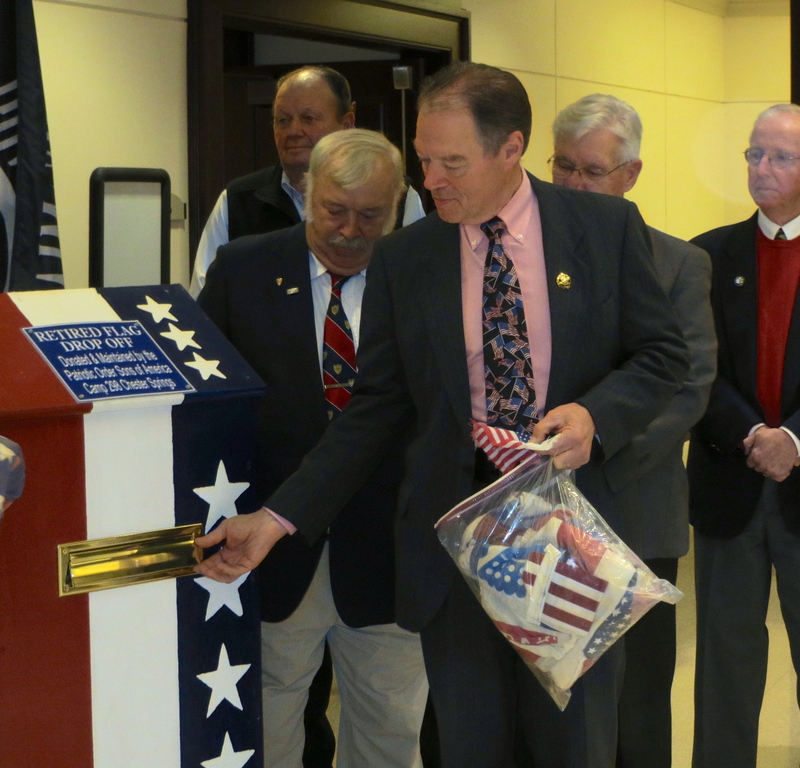 After Dewees’ remarks, two county residents stood ready to christen the receptacle. 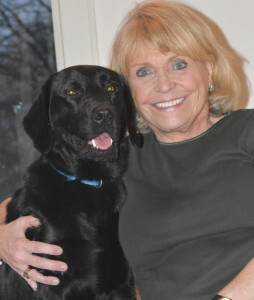 Veronica Hoadley of West Chester said she had called Welsh because she wanted to show off the 2-year-old puppy she had purchased during the sheriff’s annual fund-raising dinner. In the course of the conversation, she learned about the flag retirement box and decided to come prepared. She said she shared the information with some neighbors who added to her collection, which already included the flag that flew for years at Waterloo Gardens, which closed its doors earlier this year. The other depositor was Chief Deputy Sheriff George P. March, a Caln Township resident who toted a large Ziploc bag full of flags of all sizes. “I’ve been saving these for years,” he said. Dewees said the box, which will be located in the lobby of the Justice Center, would be checked frequently, and the flags will be collected and held until the next time a disposal ceremony is scheduled, often on Flag Day. He said the stars and blue field are typically cut from the stripes and then the pieces are burned. Sometimes the stripes are cut individually as well, he said. “What’s most important is that it’s done respectfully,” Dewees said.